Last weekend I was scheduled to run the Flying Pig Marathon in Cincinnati. 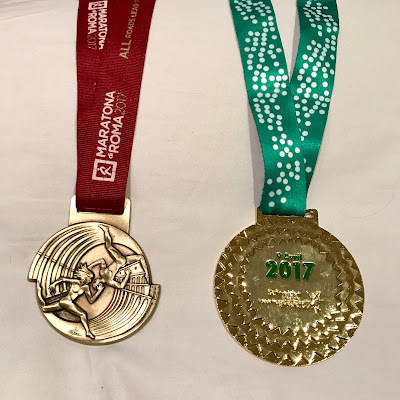 I ended up just running the half marathon. I was sick with a bad cough and both nasal and chest congestion. It probably wasn't a great idea to run even the half, but what can I say? I'm a Marathon Maniac and a Half Fanatic. 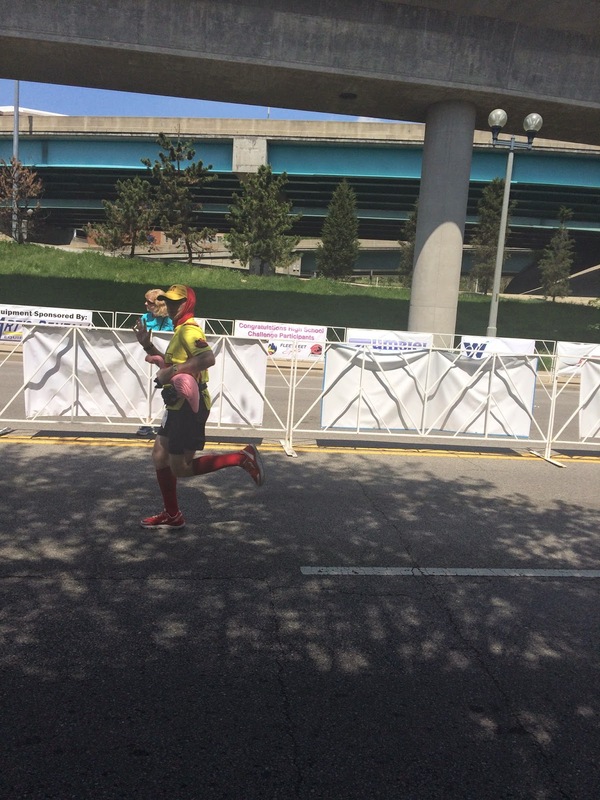 Being from Ohio, it's my goal to run all the major Ohio marathons. To date, I've run Columbus and Air Force. Now that I've dropped to the half at Flying Pig, I should reevaluate. Would I be content simply running the halfs? Or do I want to run all the big ones as full marathons? Things to ponder. Anyway...on to the race report. This was going to be another quick weekend drive in the same vein as the previous weekend's trip to New Jersey. Only this time, the drive was more than twice the distance. Scot had to work on Friday night, so we set out before first light on Saturday morning. We stopped along the way in Charleston, West Virginia to get a photo of the state house. 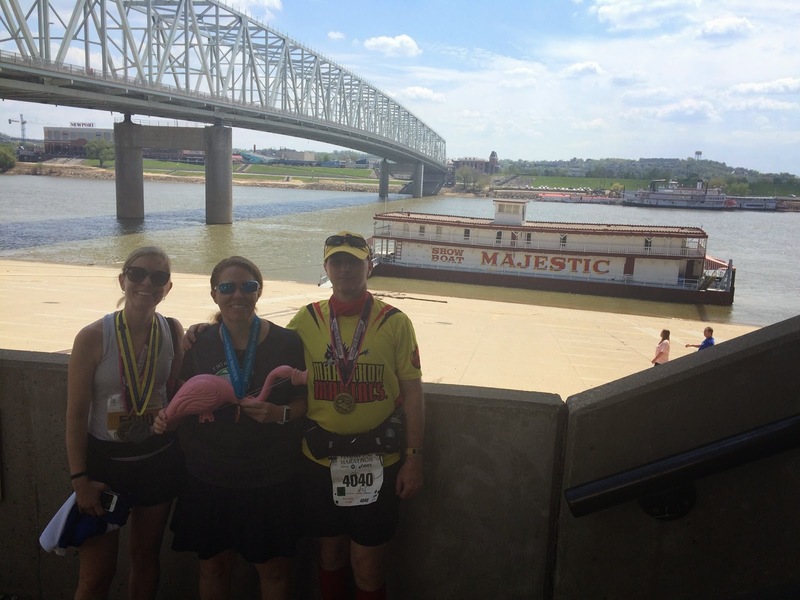 We wanted to detour to Frankfort, Kentucky to do the same, but then we would have missed the race expo in Cincinnati. 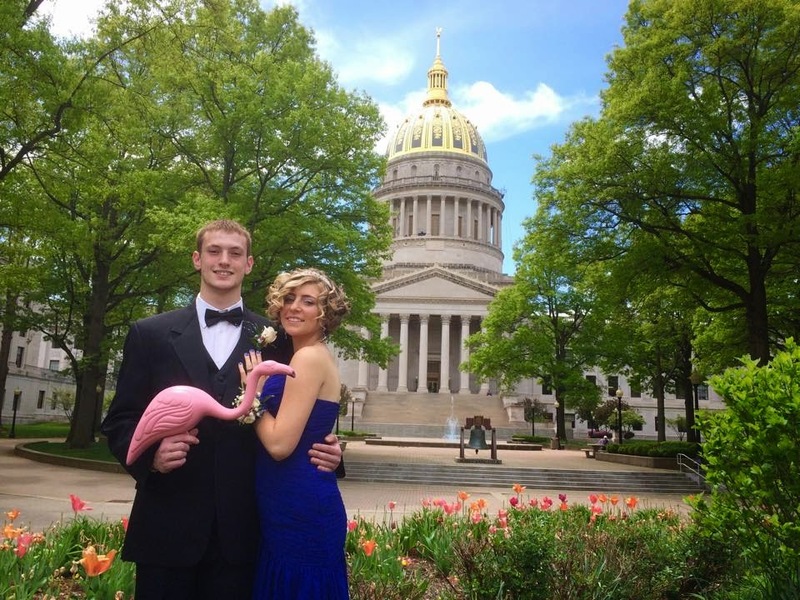 We made do with Charleston and had fun with a couple high schoolers who were there taking pre-prom pics. When we got to Cincinnati we parked the car and walked to the expo. It was a decent sized expo, but somewhat confusing. We went in the wrong door initially, and we found all the vendor booths, but we needed to ask for directions to the packet pickup, which was behind a curtained wall. After getting our bib, we then had to ask where to find the t-shirts. It turns out they were all the way on the opposite side of the exhibit hall, making us walk through the vendors first. I get that; they want us to visit the vendors. But the signage was lacking and we were so late that we wanted to make sure to get our official gear before they closed. We found the t-shirts, which were themed for the All Star baseball game, which will be held this year in Cincinnati. We didn't like this theme for the Flying Pig marathon shirt. We also got a small backpack and a poster in our race kit. Throughout the expo there were pig statues, each one painted with a different theme. We didn't see anyone we knew at the expo, even though we had lots of friends running. They must have made it to the expo before the final hours. After the expo, we checked into the Millennium hotel, which was in a good location a matter of blocks from both the start and finish line. We went out for a dinner of pizza and I called it an early night. I'd already been sick for a couple days, so I wanted to take some drugs and get some sleep. Scot went back out to scope out the start and finish areas. Morning came and I felt like I'd been hit by a truck. I had trouble breathing, I had a headache, and I felt a mild touch of nausea too. I wanted to go back to sleep. I did not want to run. But I didn't want to come this far and not run. The weather was going to be hot later in the day, and I just couldn't see being out on a marathon course for hours feeling the way I did. I acknowledged to myself that I might end up running just the half. 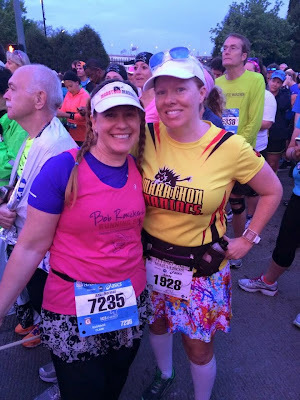 Still, I wore my Marathon Maniacs shirt just in case I felt up to it. Abbi was pacing the 2:45 group for the half marathon, so I found her in the corral. I would stay with her until the full and the half courses split after Mile 8. Subconsciously, I think I knew I would be staying with her the whole way, recognizing that I wasn't well enough for a full marathon. I would have made myself do it had this been a new state or some other milestone race, but it wasn't. I had the freedom to drop down. This race had good energy and I was happy to be there in spite of being sick. In the early miles we crossed over the Ohio River into Kentucky, and then back into Cincinnati. Abbi and her fellow pacer Meredith were doing a good job. 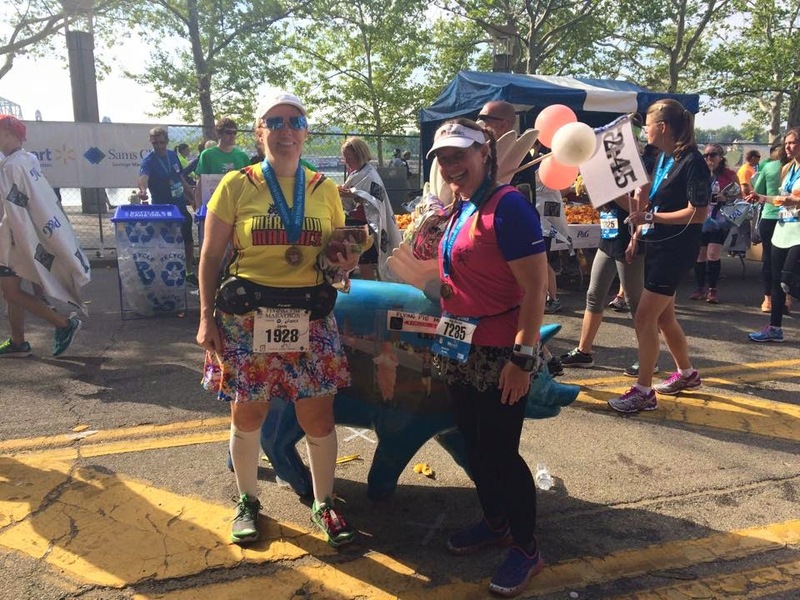 Many runners wore pig-related clothing or costumes, and so did the spectators. Then we got to the point in the race with an uphill stretch that lasted for a couple miles. The pacers did more walk intervals to get up the hill without tiring everyone out. I could not walk that fast, so I'd lag behind, then start running a little early to catch up to them before the next run interval. This worked most of the way up the hills. I saw the marathon course split off, and I was relieved that I was staying with Abbi on the half marathon course. Unfortunately, there was one last hill, and I just couldn't keep up. I fell behind and decided not to try to catch up. I was coughing and hacking and having trouble breathing even if I wasn't running a race, so it's understandable that it was hard to catch my breath while running. It was near Mile 10 that I fell behind. But at that point I also felt a sense of freedom. I knew I could do my own pace, according to what my body needed, for the last 5K of the race. And that was going to be pretty much all downhill. I ran most of the downhill and it felt good. 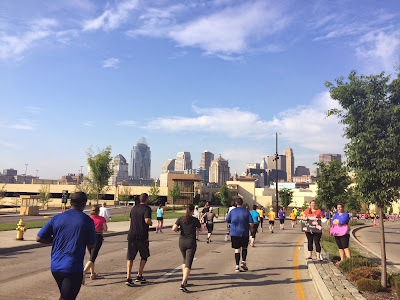 At a certain point, we had some good views of the Cincinnati skyline. Also in the late miles, the aid stations had candy. I got Twizzlers and Swedish Fish. These were nice treats. In the last mile, there was a short out & back, and I saw Abbi. I wasn't that far behind. And I was almost finished! In the finish chute, there were some folks handing out beer. I took a cup. And then I ran it in. 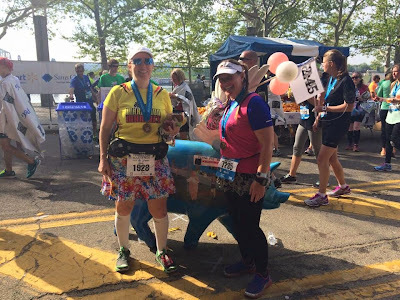 I found Abbi across the finish line and we grabbed some snacks and took some finish pictures. Then Abbi had to find her car and drive home to Louisville. I had enough time before Scot's finish to go back to the hotel for a shower. I arrived back at the finish area about 30 minutes before Scot came in. I saw lots of Marathon Maniacs, but no one I recognized. And then Scot zoomed through the finish chute. Next, we walked over to the river to take some finish pics. Then we had just enough time for Scot to shower before our late check out time. We packed the car and drove across the river so Scot could get a photo of his medal with the Cincinnati skyline. Then we drove to Columbus to meet my mom and brother for dinner. Ideally, we would have driven straight home from Cincinnati, but dinner was my only opportunity to see my mom, who had to work on Saturday and during the day on Sunday. It was nice to see them and to eat at El Vaquero, one of my favorite Columbus restaurants. The drive home seemed really long and was very late. Both Scot and I were tired, so we had to stop frequently to keep the blood flowing and stay awake (or to take a nap). I do not regret dropping to the half marathon at Flying Pig. Of course I wish I had finished the full marathon. 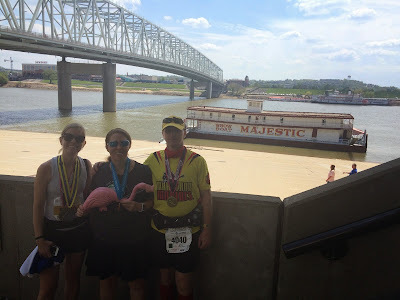 That would have been my 3rd major Ohio marathon. The good news is that this is an annual event. There is always next year, and because the race was well-managed, it's one I won't mind repeating. 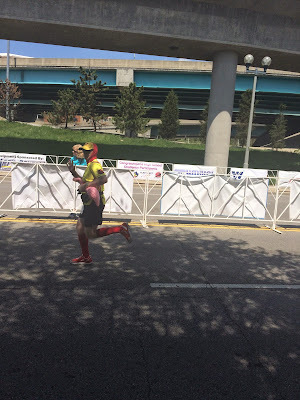 Bonus: check out my race review on BibRave. She was actually talking about doing something different with her hair for races. I say no…we love the braids!